X-ray irradiation is well known as a non-destructive testing method for technical components. Unfortunately using simple irradiation technique there is no possibility to get information about the depth of the imaged structures. In 1932 de Plantes  performed first experiments to image an object layer by layer. The technique was called laminography and was used in medical diagnostics till the 70th. Furthermore the development of computed tomography (CT) allowed a nondestructive imaging of object slices, but with the restriction that the objects have to be irradiated from the full angular region. Because of high absorption and limited access this is not always possible, e. g. in the case of flat components as multilayer printed circuit boards or welding seams in big components. Laminographic methods are able to overcome these difficulties. They yield images of object slices and allow the determination of the position of the object structures. This article gives a short overview of the existing laminographic methods and the possibilities to use digital laminography for industrial applications. Classical laminography is based on a relative motion of the x-ray source, the detector and the object. The x-ray source and the detector are either moved synchronously on circles as shown in Figure 1 or are simply translated in opposite directions as shown in Figure 2. Due to that correlated motion, the location of the projected images of points within the object moves also. Only points from a particular slice, the so called focal slice, will be projected always at the same location onto the detector and therefore imaged sharply. Object structures above and below the focal slice will be permanently projected at different locations. Because of that, they aren't imaged sharply and will be superimposed as a background intensity to the focal slice. This principle of superimposing projections is called tomosynthesis. Of course rotational laminography needs a more complicated mechanical scanning system than translational laminography however it yields better results, because of the bigger angular region from which projections are obtained. The main disadvantages of classical laminography are the background intensity that reduces the contrast resolution, the complicated mechanical scanning system and the fact that in each measurement only one slice is imaged sharply. All other slices have to be inspected consecutively by displacing the object vertically. The only difference between digital and classical laminography is the use of a digital x-ray detector so that a series of discrete projections can be digitally stored. Nevertheless this helps to overcome some of the above mentioned disadvantages. E. g. all object layers can be obtained with only one measurement by sorting the data [2,3]. So it becomes possible to test objects 3-dimensionally within acceptable times. Moreover there is the possibility to reconstruct the projection data measured under many angles using well known CT reconstruction algorithms like the Algebraic Reconstruction Technique (ART). This leads to a higher contrast resolution and overcomes the smearing out effect of simple tomosynthesis but needs more time. The Fraunhofer Institute Nondestructive Testing IZFP developed a laminographic method, named computed laminography (CL), which only requires a simple linear translation of the object through the fan beam of an x-ray source [4,5]. Both the x-ray source and the detector remain stationary as shown in Figure 3. Alternatively the object can remain stationary and the x-ray source and the detector can be moved synchronously but without a relative movement. So it becomes very simple to examine e. g. large and heavy objects that normally cannot be easily examined with classical laminography because of the complicated mechanical system set-up. During the movement the object is irradiated by the x-rays under different angles due to the fan beam with an opening angle . So the elements of the detector get successively information of a given volume element of the object under consecutively changing angles and these digital projections contain the complete structure information of all object slices. To obtain cross sections comparable to classical laminography the projection values simply have to be sorted and added correctly. Figure 4 shows that CL is equivalent to a CT with a limited angular region, allowing the use of special CT reconstruction algorithms like ART to enhance contrast resolution. Additionally it is possible to integrate 'a priori' information to these algorithms reducing the reconstruction time and the artefacts caused by the limited angular region and leading to a higher image quality. Artefacts arise because projections are only obtained from a small aperture. This reduces furthermore the geometrical resolution compared with a traditional CT. Figure 5 shows the dependence of the ratio of the axial to lateral resolution as a function of the fan beam opening angle. The axial resolution, that is in line with the x-rays, is always smaller than the lateral resolution, perpendicular to this direction. The ratio V becomes 1 by an angle of 180° what would be equivalent to a CT.
Beside the several possibilities in acquiring data with laminographic methods one can achieve big differences in the quality of reconstructed cross sections by varying the reconstruction method. A simple tomosynthesis as described in chapter 2 yields results in a relative short time, but normally the cross sections are blurred and only few details with high contrast are visible. Using e. g. ART which is an iterative reconstruction technique more time is needed but much more details can be seen. 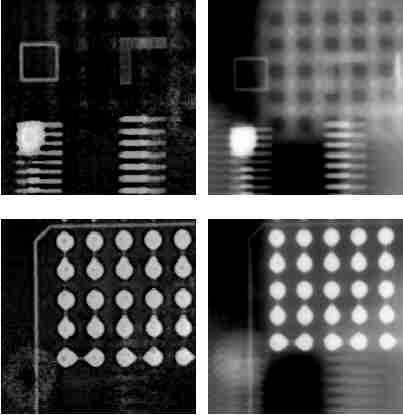 An example for the higher quality of images obtained with CL using ART in comparison to tomosynthesis is shown in Figure 6, where surface mounted devices were examined with CL using tomosynthesis (images a. and c.) and ART (images b. and d.). Digital laminography is a suitable method to examine flat components like printed circuit boards or welding seams. For the examination of printed circuit boards there even exist several industrial systems like e. g. the Feinfocus µ-3D Visualiser or the HP 5DX Series II, formerly known as the Four Pi System. An example for a 3-dimensional reconstruction of CL data can be seen in Figure 9. The solder connections of the circuit board to a resistor, a chip and a capacitor just opposite to the chip are imaged. The board itself is not visible in this representation. We were interested in the examination of the connections of the chip to the circuit board. 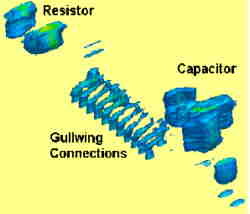 Just in the region opposite to the high absorbing capacitor a simple irradiation technique shown in Figure 8 was not able to answer the question whether there is a gullwing connection with sufficient solder or not, because of the projection technique that superimposes the images of all object details in one direction. CL shows that there are three connections with an insufficient soldering. Another field of interest is the examination of welding seams. Figure 10 shows on the left side a CL of an Al welding seam with a crack and a lot of pores. Because of the limited access a lot of artefacts arise and the shape of the sample can not be resolved. Fig 10: CL of an AL welding seam with crack and pores. The image on the right side shows a reconstruction simply using the object surroundings as 'a priori' information. The artefacts are minimised, the position of the crack and the pores inside the weld can easily be detected and the image is much sharper. Furthermore the reconstruction time can be dramatically reduced. Laminographic methods turn out to be excellent x-ray methods for the inspection of flat components like printed circuit boards or welding seams in big and flat components. Compared with classical laminography, the use of digital x-ray detectors has a lot of advantages and makes it possible to use digital laminography as a modern industrial NDT method. One of us (S.G.) was supported by the graduate college "Grundlagen und Technologie von neuen Hochleistungswerkstoffen" financed by the "Deutsche Forschungsgemeinschaft".